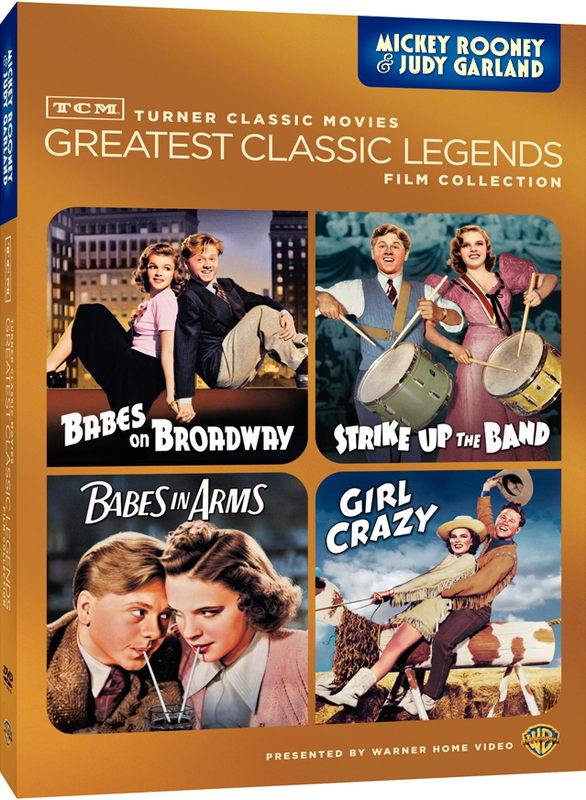 This new set will feature each of the four films only, as all of the TCM Greatest Classic Films (Legends) series do. Now’s your chance to have the four Mickey/Judy “Let’s Put On A Show” musicals for a low retail price ($27.92). GIRL CRAZY (1943): With Judy makin’ Bidin’ My Time a cowboy hoedown, Mickey mimicking a boxing announcer in a knockout comedy bit and Tommy Dorsey providin’ Fascinatin’ Rhythm, this Gershwin tunefest is a swell bidin’ of everyone’s time, including a joyous Busby Berkeley-staged I Got Rhythm finale. STRIKE UP THE BAND (1940): Mickey and Judy lead the effort to enter their school band in a swing-music contest hosted by Paul Whiteman. Judy solos Nobody, Rooney dances and drums with volcanic energy and director Busby Berkeley brings his famed angles, precision dance and cutting to Do the La Conga and the rousing title finale. BABES IN ARMS (1939): With Rodgers and Hart songs and Busby Berkeley direction, this tale of kids rescuing their cash-strapped vaudevillian parents by putting on a show is Mickey and Judy’s first musical together, Arthur Freed’s first producer credit and Rooney’s first Oscar® nomination. BABES ON BROADWAY (1941): This time the babes aid inner-city kids by puttin’ on a show. Mickey hoofs, clowns and shakes his fruit basket as Carmen Miranda. Judy sings and emotes (in French!) as Sarah Bernhardt. And both bring down the house with How About You, Hoe Down and a minstrel-show stopping finale. Audio-Only Bonuses: Two Leo Is on the Air Radio Promos, Merton of the Movies Radio Adaptation with Rooney and Garland and Chin Up! Cheerio! Carry On! Song Demo Performed by Burton Lane. too bad I already have them, they should be releasing things we don’t have I.e Little Nellie Kelly, Listen Darling and a Child Is waiting, Andy Hardy Meets Debutante and Life Begins for Andy Hardy…those are worth buying…hurry up TCM and get those out already! It looks like a barebone edition of the Mickey Rooney & Judy Garland Collection, since there is no mention of extras. Can’t they give us what hasn’t been released yet? This does indeed seem odd. If you recall, Warner Home Video released in 2007 the “Mickey Rooney & Judy Garland Collection” of the exact same films in an “ultimate collector’s edition.” Why on earth would they re-release the same set, except to make a few bucks in a discount package? I think that’s exactly why they are re-releasing this collection, Mr. Schulman; to make a few bucks in a discount package. By the way, I adore the recent Garland CD set that you co-produced. Your liner notes are intelligent treating those new to Garland as well as the expected fans with essays that are fresh and informative. And, of course, the recordings themselves sound wonderful! I can’t wait for the new Decca recordings CD set. Thanks much from a Garland fan.